This article provides in-depth fundamental analysis of PIX Transmission Ltd, a manufacturer of power transmission belts applicable in industrial, agricultural, lawn & garden and automotive segments. It has been a great learning experience reading your articles. Based on my learning, I have done analysis on PIX Transmission Ltd. If time permits, please go through the attached report. PIX Transmission Ltd (PTL) incorporated in July 1981, is a publicly listed company promoted by Mr. Amarpal S Sethi (Chairman and Managing Director) manufacturing rubber V-belts. The company has two manufacturing units located at Hingna, Nagpur and an automated rubber mixing facility at Nagalwadi in Nagpur, Maharashtra. PTL’s products are sold in India and abroad through its network of approximately 125 distributors in 20 countries. The company sold its hose assemblies division along with its manufacturing unit located at Bazarwadi, Maharashtra to Parker Hannifin (I) (P) Ltd. for a sale consideration of Rs. 241.85 crore in July, 2012. On account of this deal, the company made a Profit after tax of Rs.100 crore in FY13. Let us first try to analyse the financial performance of PIX Transmission Ltd over last 10 years. We believe that while analysing any company, an investor should always look at the company as a whole. Therefore, she should focus on financials, which represent the business picture of the entire group including operations and assets. PIX Transmission Ltd has two subsidiaries as called PIX Transmission Ltd UAE, and PIX Transmission Ltd Europe Ltd. Further, it has fellow subsidiaries named PIX Transmission Ltd trading UAE and PIX Transmission Ltd Germany. PIX Transmission Ltd has been growing its sales in the past 10 years at a rate of about 4 percent. However, there has been a marginal improvement in the past 3 years, wherein the sales growth has been 6 percent. Such low growth in sales is not desirable for investment. 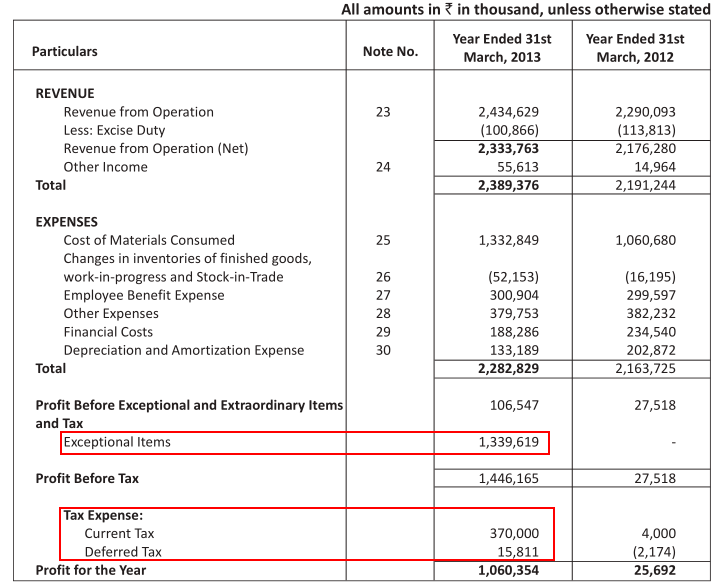 PIX Transmission Ltd has a poor net profit margin of 2 percent over a period of 10 years. However, in the recent years, the NPM has gradually improved from mere to 2 percent to reasonable 6 percent in FY 2017. The main reason for such low NPM seems to be the heavy interest cost over several years. It was suffering from a poor and risky debt equity levels of 6 in FY2009. However, over the last 10 years, it has been able to reduce its debt-equity ratio to .8, which is worth noticing. This is reflected in NPM of the year 2016 at 6 percent. PIX Transmission Ltd has a very surprising level of tax payment ranging from negatives (no payment) to as high as 109 percent further stabilising in the range of 35 to 40 percent in the last 3 years. It is not a desirable sign since it indicates that company has been a laggard in paying its taxes on time. As mentioned before, PIX Transmission Ltd has been able to reduce its debt remarkably. It is visible in the interest coverage ratio as well. From mere 1.9 to 3.2 ICR in the year 2017. Interest coverage ratio above 3 indicates that company would be able to sustain itself from failing to make interest payments. As noticed above, the company has not been able to grow its sales. One of the major reason could be the fall in its net assets turnover in the past 10 years from 2.88 to 1.45 in the latest financial year. This is a poor performance in utilising its assets. A low NFAT ratio also indicates that it is not a competitive industry, consistent operating margin ensure that as well. The receivables days have increased in the past years from 63 to 84 days, indicating that there is a significant delay in realising sales, which may affect its working capital. However, the inventory turnover has improved from mere 2 times to 6 times in recent years. It indicates that company has been able to convert its inventory into sales in recent years. Note- if we analyse recent years, we may notice that there has been an improvement in sales growth (7 percent), which may have caused in increased receivable days and higher sales are further shown in bettering inventory turnover ratio. Note- ideally ITR should remain stable or improve with performance. In the year 2017, the current ratio is 1.41, which is a tad above 1.25. However, it shall be noted that the current ratio has been depleting over years. It used to be around in the year 2009. One needs to analyse for such worsening depletion. Cash flow from operations: PIX Transmission Ltd has positive cash flows over past 10 years. It is a positive sign. The cash flow from operations is much higher than cumulative profit after tax i.e. Cumulative PAT = ₹139 cr. Cash flow from operations= ₹447 cr. Note- One should analyse such difference with caution. In 2013, the company has NPM of 45 percent, other income of over ₹100 crore and these are reflected in cash flow from operations. On first look, it seems one-time cash inflow. Analysing the cash flow statement you notice that cash flow from operations is able to meet requirements of investment and financial activity. One question comes to my mind: Is this company a cash cow? 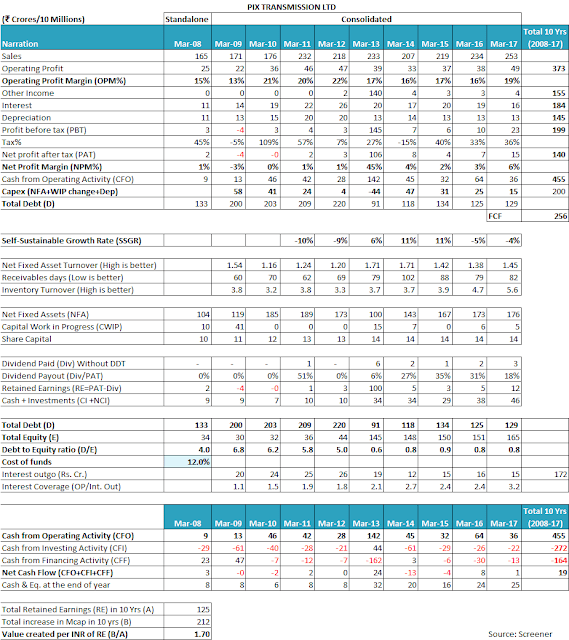 I have not been able to analyse such difference in cash flow and PAT. Please solve this doubt. The only big difference I could find was the sale of fixed assets for ₹86 crore in the respective year i.e. 2013. P/E ratio-Currently available at a PE ratio of 14.90.The equivalent PE for Government security yield of 6.7 is 15. Hence, there is a precise margin of safety. PEG ratio: PEG ratio is extremely less, i.e. .20 indicates it is available at a cheap valuation. Price to sales- exact 1.
Dividend yield- 1.17 percent (pretty close to the benchmark of 1.25). Free cash flow as a percentage of CFO is 30 percent, providing 0.5 to acceptable PE. So, the acceptable PE shall be 15.5. Conclusion: PIX Transmission Ltd seems to be available at a reasonable valuation, providing a great margin of safety. Self-Sustainable Growth- SSGR, as seen in the excel sheet, is mostly in negatives. However PIX Transmission Ltd has been able to decrease its debt considerably and it has an adequate amount of free cash flows. Doubt- what could be the possible reason for the same? Therefore PIX Transmission Ltd has created a wealth of ₹1.90 for every rupee retained over past 10 years. As per Warren Buffet, a company shall create at least ₹1 for every ₹1 retained by the company. No news on default, fraud or unethical news about the management of the company on the web. 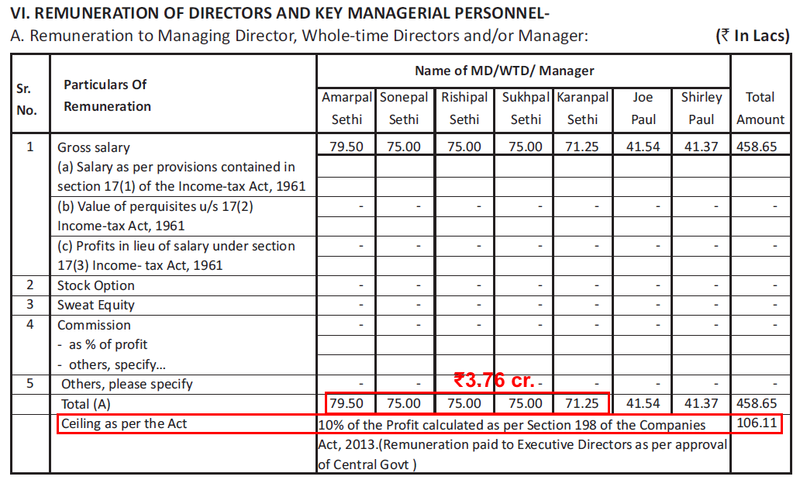 The salary structure of the founder promoter seems to be very unusual and I would say illogically high salary as a percentage to the net profit in the years of lower profits. This is not acceptable and raises red flags. Only significant related party transaction that came to my notice was payment of rent by PIX Transmission Ltd to its KMP and entities in which KMP had interest. 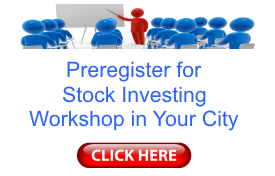 Why would a listed company pay rent to its KMP? Companies should avoid it. 5) Is the management focused on market cap and share price? Reading through the annual report, one finds that the founder promoter never mentions anything about the market cap or the share price. One of the decisions of the sale of hose unit was focused on the long-term vision. It helped the company to improve its liquidity and credit rating. 6) Dividend: is the company relying on debt for payment of dividend? PIX Transmission Ltd has generated free cash flow of about ₹130 crores over 10 years and has paid dividend amounting to ₹15 crores. Debt has almost halved from ₹200 crore to ₹110crore in 10 years. Further, it has cash and investments about ₹45 cr in fy2017. The cash has been increasing continuously for past 10 years. Query- what about 70 crores of difference between FCF and div payments and cash at balance sheet?Are other income and cash difference of ₹70cr been used to pay interest payment of 190 crores? (i) I found cumulative CFO operations to be very high than PAT. Has the company manufactured it? We notice that PIX Transmission Ltd has been able to reduce its debt impressively. However, despite that, the company has abundant FCF and cash at b/s. Why isn’t the company using the cash on hand to pay off the debt? Is it advisable to have debt when one has cash at hand? The decision taken by the management to sell off hose division has had a favourable impact on its balance sheet. Further, care rating has emphasized on the quality and experience of its management in the v-belt industry. Karanpal Sethi seems to be youngest among the promoters at the age 31. He is the chief financial officer. Further, he has requisite qualification to handle the operations of the company. As of now, he has been associated with the company for 10 years. Presently, promoters hold 60.95 percent stake in the company showing further faith in the business. Promoters have increased holding by 2.35 percent in the last 3 years. One of the most important decision pertains to the sale of hose division at a profit of ₹100 crore in year 12-13. This has resulted in increased liquidity. Improvement in credit rating by CARE post sale of hose division. It shall be appreciated that CARE has taken into account deteriorating receivable days and NFAT (working capital) in its credit reports. Equity Dilution by an increase of 700,000 shares in the respective year. As mentioned in the board letter, PIX Transmission Ltd commenced production of its brand new facility in Nagpur. Hence, it was a year of consolidation for PIX Transmission Ltd.
One shall also notice that now PIX Transmission Ltd sells only v-belts post the sale of hose division, causing 10 percent decline in its total revenues. However, it has improved its liquidity, which is reflected in revised credit rating. The revision in the ratings assigned to the bank facilities of PIX Transmission Ltd. factors improvement in solvency & liquidity profile post the sale of hose division in FY13, mitigation of project risk with the completion of capex, expected improvement in general economic environment auguring well for V-belts industry coupled with improving financial metrics. Board’s letter mentions that company has enough capacity to cater any demand for v-belts. This is very important since the company has no capex plans in coming years and sales have been growing poorly. Hence, it can be concluded that if the company operates well, then it can increase its sales without significant capex. No significant input from the annual report. Boards’ letter takes into account the noticeable increase in the profitability by 164 percent. It also talks about improving the overall corporate environment. improvement in credit rating for long-term as well as a short-term credit facility. Long-term: From BBB- in 2015 to BBB+ for long-term lending. Short term: from A3- in 2015 to A3+ for short-term lending. PIX Transmission Ltd sold hose division in year 12-13. Since then the company has been improving its profitability. Further improvement in liquidity has improved its credit rating from poor or worst D in 11-12 to A3+ in year 16-17. The improvement in rating was backed by a consistent operating margin. However, the company has adverse working capital cycle over past 5 years, which may have an adverse impact on its rating. The credit rating gives a positive outlook on management’s ability to reduce its debt.The debt to equity has come down come down from 6.1 to .8 in recent years. Further, any significant changes in prices of raw material may have an impact on company’s profitability. However, PIX Transmission Ltd seems to have some pricing power, allowing it to maintain a healthy profit margin of 17 to 18 percent over past 10 years. As per our analysis, we find that company has been operating a consistent operating margin over the past 10 years and the management has been able to create adequate free cash flow and reducing the debt level as well. Further, there is a major improvement in its credit rating. However, the major concern is revenue growth. It has poor sales growth. Further, I see no additional capacity to be added in recent years. Henceforth, I would keep it on watchlist until I see some growth in its revenue. Thanks for sharing the analysis of PIX Transmission Ltd with us! 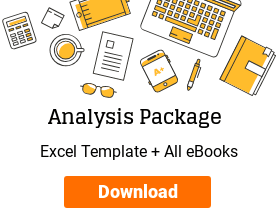 We appreciate the time & effort put in by you in the analysis. Let us first try to analyse the financial performance of PIX Transmission Ltd over last 10 years. Screener website provides consolidated financials of the company from FY2009 onwards. Therefore, while analysing the financial performance of the company for last 10 years (FY2008-17), we have analysed standalone financials for FY2008 and consolidated financials from FY2009 onwards. This ensures that we are able to have the complete assessment of PIX Transmission Ltd including its subsidiaries. We can divide the financial performance of PIX Transmission Ltd over last 10 years into two distinct periods. The first period is up to FY2013 when the company had two distinct business divisions of belts and hoses. The second period is from FY2014 onwards when the company sold its hoses division and focused solely on the belts division. Because of this business restructuring in FY2013, any analysis based on the trend of reported financial numbers over entire 10 years might not represent the true picture. Therefore, investors should segregate the performance of these two distinct performance periods of the company during their analysis. An investor would note that overall during FY2008-17, the sales of the company have grown at an annualized rate (CAGR) of 5%. However, since FY2014, the sales of the company (resultant belts division) have grown at a rate of 7%. 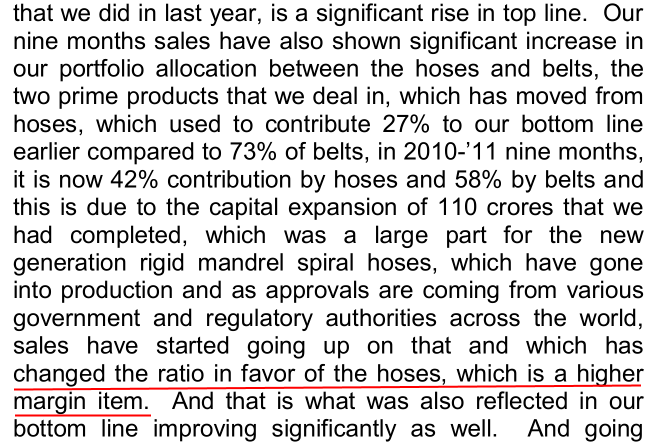 The impact of the sale of hoses division in FY2013 is clearly visible when an investor notices that the sales of the company declined from ₹233 cr. in FY2013 to ₹207 cr. in FY2014. Since FY2014, the sales have increased to ₹253 cr. in FY2017. An investor would notice that the operating profit margin (OPM) of the company has witnessed significant change over the two distinct business periods. From FY2010 to FY2012, when the hoses division was contributing to the full year’s performance, the company could report OPM exceeding 20%. 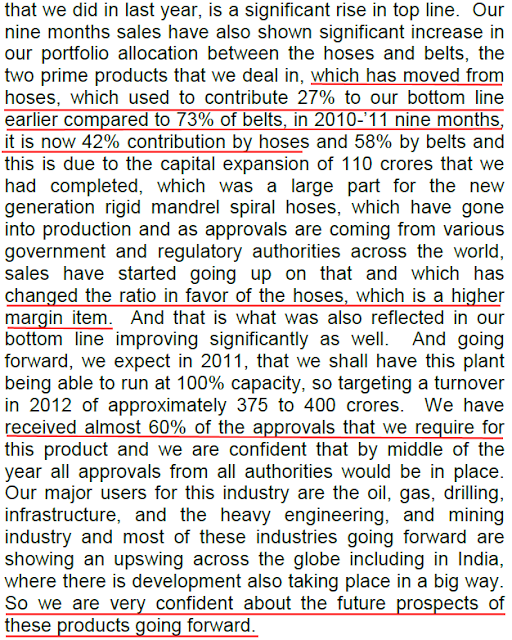 However, since the sale of hoses division in FY2013, the OPM has declined to 16-19%. Because of the sale of the high margin hoses business, now the company has only the comparatively low margin belts business. A look at the trend of the raw material costs as a percentage of sales would indicate that since FY2014, the raw material costs of PIX Transmission Ltd has been varying from 46% to 33%. Such wide fluctuations in the raw material cost as a percentage of sales indicate that the company is not able to pass on the changes in the cost of the raw material (primarily rubber & rayon) to its customers. An investor would notice that over the years, net profit margin (NPM) of PIX Transmission Ltd has been in low single digits and even turning negative at times. This is despite the OPM of the company being at healthy levels of 16-20% over the years. An investor would note that companies with good OPM levels might not show good NPM when the components like interest expense and depreciation eat into most of operating profits. In such cases, high depreciation levels indicate that such companies operate in asset-heavy/capital-intensive industries. High interest expenses indicate that such companies have funded their capital-intensive business needs by taking debt and as a result, they are using a significant portion of the operating profit to meet interest expense. An investor would note that PIX Transmission Ltd is also facing the similar challenges. Over the years, it has reported healthy OPM of 16-20%. However, the NPM has been very low. 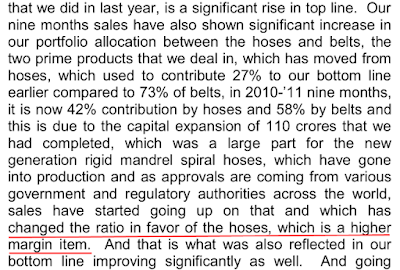 (Year FY2013 is an exception because the very high level of net profit/NPM is due to the gains realized from selling the hoses division). An analysis of the net fixed asset turnover (NFAT) of PIX Transmission Ltd would indicate that its asset turnover has been in the range of 1.20 to 1.50 over the years. It indicates that the company has been operating in a capital-intensive environment where it needs to continue to do capital expenditure on its existing plants to keep them running as well as to create additional capacities for growth in future. The NFAT of the company has been within the same range of 1.20-1.50 over last 10 years indicating that both the belts and the hoses divisions have had the similar level of capital requirements. Therefore, the change in the focus of the company to manufacture only the belts has not changed the nature of its capital needs and as a result, it has significant depreciation expenses. The company has been funding its capital expenditure requirements by raising debt. An investor would note that the company embarked upon a significant capital expansion in FY2008-10. The company faced an economic downturn in light of global economic slowdown at the same time. However, it did not scale back its capital expansion plans and went ahead with the capacity expansion, which it funded primarily by debt as is evident from its rising debt levels during FY2008-10. Though the promoters infused a small quantum of equity during this period by way of warrants, however, we have elaborate more upon it in the later part of this article. An investor would note that the loans of ₹194 cr. from outside parties would bear an interest cost and would have a time schedule for repayment of these loans. Assuming an interest rate of 12% (which is appropriate for a small company undertaking a large capex with debt to equity of about six times during this period), the loans from outside parties would bear an interest outflow of about ₹23 cr. (194 * 12%). Moreover, assuming a loan repayment schedule of 7 years, the company would have to repay about ₹27 cr. per year (194 / 7). An investor would note that the company would need about ₹50 cr. (23 + 27) every year to service the debt from outside parties. (The cash requirements would reduce in future as the loan amount reduces due to repayment, which reduces the interest outflow. However, it stands true only in cases where loan repayment is from company’s profits. In cases, where companies take fresh debt to repay old debt, the cash requirements to service debt do not reduce over time). An investor would note that during FY2010-12, PIX Transmission Ltd had cash flow from operations (CFO) of ₹46 cr., ₹42 cr. and ₹28 cr. respectively. It indicates that the CFO was insufficient to meet the cash requirements of debt servicing. Moreover, the capital-intensive nature of company’s business needed that the company should spend a significant amount continuously on maintaining its plant and machinery as well. As a result, the investors would note that the despite completion of the new capacity in FY2010, the company’s debt levels kept on increasing in following years. This is because it seems that the company was not able to make sufficient CFO to service its existing debt and meet the maintenance capex. As a result, the company had to raise more debt to meet the cash shortfall. An investor would appreciate that such a situation where a company needs to raise new debt to repay the old debt and to meet its capex needs would leave any company in a tight liquidity situation. Many times, in such situations, the companies have to resort to selling their assets to ease the liquidity position. It seems that PIX Transmission Ltd has also faced similar circumstances and as a result had to sell the hoses division to improve its liquidity situation. This is despite the fact that the management seemed to know that hoses division is a high margin business, where it had recently created a lot of capacity and it was receiving approvals from various authorities for the plant. An investor would appreciate that if companies use debt to fund their expansion plans, then many times due to liquidity stress, companies might need to sell their assets, which are very critical for their future growth plans. The company received a significant amount of cash from the sale of hose division and it used part of the cash to reduce its debt liabilities from ₹220 cr. in FY2012 to ₹91 cr. in FY2013. Since FY2013, the company has again witnessed its debt levels increase to ₹129 cr. in FY2017. 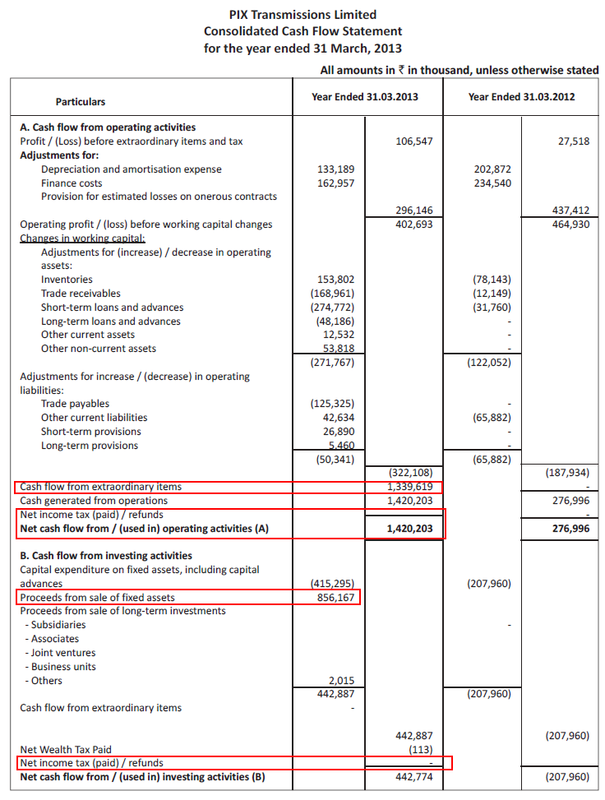 As discussed above, an investor would appreciate that PIX Transmission Ltd has not been able to report good NPM despite healthy OPM as most of its operating profit is consumed by high depreciation expense due to capital-intensive business and interest expense due to debt-funded capital expansion decisions. Over last 10 years (FY2008-17), the company has generated operating profit of ₹373 cr. out of which interest expenses consumed ₹184 cr. and depreciation consumed another ₹145 cr. Thereby leaving only ₹44 cr. as profit before tax (PBT) from operations (44 = 373-184-145). An investor would appreciate that a PBT of ₹44 cr. from operations over FY2008-17, would amount to a net profit after tax (PAT) of about ₹30 cr. from operations assuming 30% tax payout ratio. An investor may also conclude that out of the total PAT reported by the company of ₹140 cr. over last 10 years (FY2008-17), about ₹110 cr. (140-30) is either from non-operating income or from the sale of hoses division. It seems that cash available with the company on FY2017, ₹46 cr. does not represent the operating business strength of the company. This is because when an investor analyses the cash position of the company year on year, then she notices that the company had a cash of ₹34 cr. in FY2013, which was the result of the sale of the hoses division. Post FY2013, the cash of the company has increased by ₹12 cr by FY2017 to ₹46 cr. whereas during the same period, the debt level of the company has increased by ₹38 cr. i.e. the total debt has increased from ₹91 cr. in FY2013 to ₹129 cr. in FY2017. As money from one source is fungible with the money from another source, therefore, an investor can interpret that the increase in cash with the company during FY2013-17 is funded by the increase in debt taken by the company. 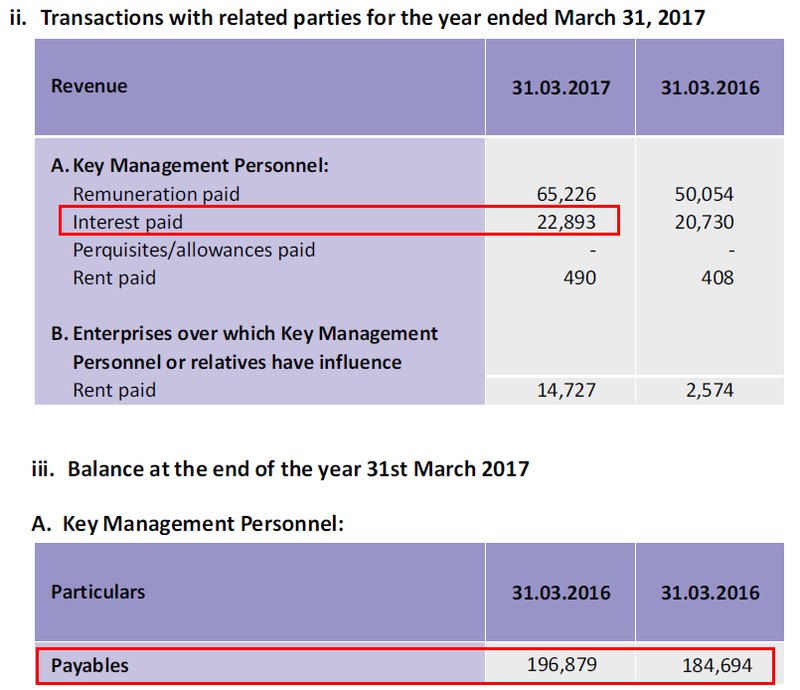 The tax payout ratio of PIX Transmission Ltd has been very erratic due to factors like deferred taxes, capital gains etc. It is advised that the investors may take clarifications from the company about its tax payout ratio to have an idea about the reasonable tax payout ratio for future. Looking at the inventory turnover ratio (ITR) of PIX Transmission Ltd, an investor would notice that ITR of the company was hovering around 3.8 until FY2013 when it operated both the hoses and the belts divisions. Since FY2014 onwards, the ITR of the company has improved to 5.6 in FY2017 indicating that the company is able to use its inventory with improved efficiency in the belts business division. An investor would note that the company had receivables days of 62 in FY2011 when the hoses capacity expansion became functional. Subsequently, the receivables days deteriorated to 79 in FY2013, which might be a result of the lenient credit terms offered by the company to customers to utilize the newly created production capacities. In FY2014, after the sale of hoses division in the previous year, the receivables days increased sharply to 102 days. An investor may do further analysis of this sharp increase in receivables position to assess whether the company sold off the hoses division but had to keep some of the receivables with itself, which might have been tough to collect for the buyer of the hoses division. The company has changed its business operations during FY2013 by selling the hoses division; therefore, the SSGR figures of the period before FY2013 do not represent the business picture applicable today. The company has recognised the gains from the sale of hose division of about ₹100 cr. in the P&L in FY2013, which has inflated the SSGR for this period as PAT is an essential constituent of the SSGR formula. We use an average of preceding 3 years for all the constituent parameters to calculate the SSGR for any year. Therefore, the impact of high PAT for FY2013 has affected the SSGR calculations until FY2015. This is because the SSGR for FY2015 takes into account 3 year average (FY2013, FY2014 and FY2015) of all the parameters. The SSGR of FY2016 and FY2017 represents the true business picture of PIX Transmission Ltd for the remaining belts division. An investor would notice that the SSGR of the remaining belts division of PIX Transmission Ltd (as discussed above for FY2016 and FY2017) is about -5% (negative 5%). The key factors leading to low SSGR are low NFAT (capital intensive business), low NPM and high dividend payout (about 25-35% in FY2014-17), which leaves little funds to be deployed in the business to fund future growth. As a result, an investor would notice that since FY2014 when the company is running only the belts division, it has to raise additional debt of ₹38 cr. (Debt increased from ₹91 cr. at the end of FY2013/start of FY2014 to ₹129 cr. in FY2017) to fund the 7% annualized growth rate over FY2014-17. This is because the current business dynamics of the company do not support any growth as evidenced by negative SSGR. The company had to pay interest expense of ₹72 cr. over FY2014-17 (17+20+19+16). Please note that we have factored in only the P&L interest expense here as the capitalized interest, which is over and above the P&L interest expense, is already a part of the capital expenditure in the point above. Moreover, the company decided to pay dividends of ₹8 cr. over FY2014-17 (2+1+2+3), thereby, increasing the shortfall to ₹21 cr. (13+8). The company resorted to raising debt of ₹38 cr. over FY2014-17 as debt has increased from ₹91 cr. at the end of FY2013/start of FY2014 to ₹129 cr. in FY2017. The excess debt raised by the company over and above the cash shortfall calculated above, is present with the company in the form of the increased cash balance of ₹12 cr. over FY2014-17 when the cash & investments increased from ₹34 cr. in FY2014 to ₹46 cr. in FY2017. Please note that these calculations are done in a rough back of the envelope manner. Certain other factors like dividend distribution tax etc. will also impact the cash balance of the company, which would be one of the reasons that the increase in cash is ₹12 cr. and not ₹17 cr, which is the excess debt raised by the company (38-21). From the above cash flow calculations, an investor would notice that the company is not generating sufficient CFO to meet its capex and debt servicing requirements and therefore, it has to raise debt. Moreover, when an investor notices that out of the additional debt of ₹38 cr. raised by the company over FY2014-17 (Debt increased from ₹91 cr. in the end of FY2013/start of FY2014 to ₹129 cr. in FY2017), the promoters/related parties have contributed ₹11 cr. and the outside lenders (banks/FIs) have contributed the balance ₹27 cr. During FY2014 to FY2017, the promoters that occupied the executive positions in the company, the five members of the Sethi family, drew together remunerations of ₹15.53 cr. (2.43+3.76+4.10+5.25). 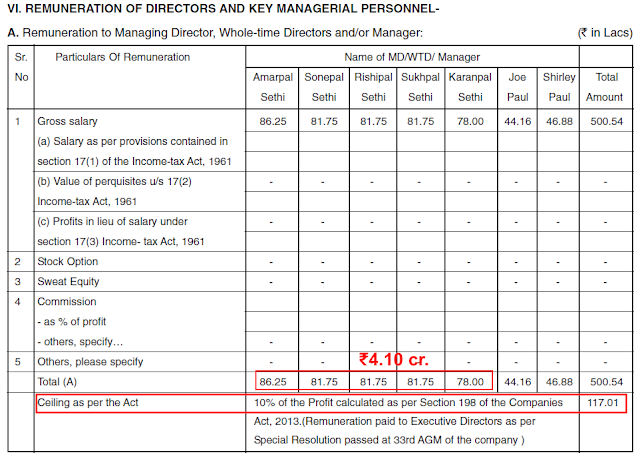 An investor needs to note that the remuneration paid by the company to the promoters is significantly higher than the overall ceiling put in by the Companies Act 2013. 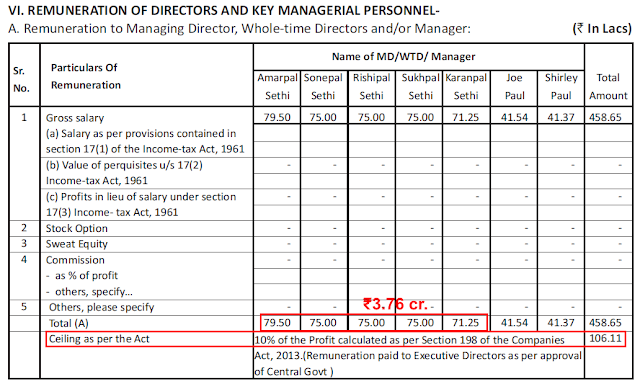 The promoters have taken home remunerations, which are at times about 40-60% when compared to the net profit after tax (PAT) of the company. In the above sections of the annual reports, an investor would note that the remunerations taken by three of the members of the Sethi family: Sonepal, Rishipal and Sukhpal are equal every year. 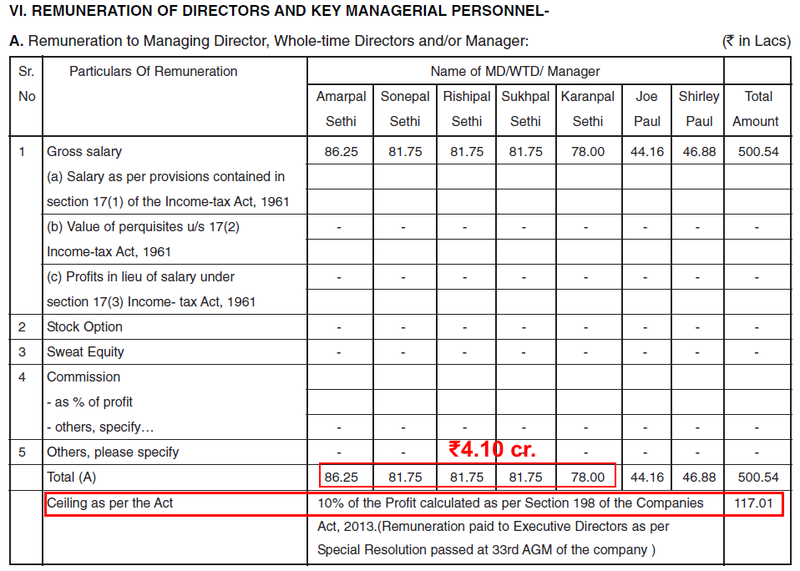 This might indicate that as per the company’s assessment, these three members of the promoter family are contributing exactly equal value to the company each year and also that the incremental value added by these members every next year by their increased experience is also exactly equal as reflected by their equal remuneration hikes every year. An investor would agree that one of the interpretations that can be assigned to such remuneration practices is that the related parties are taking high remuneration, which in turn is leading to the shortfall in cash generated by the company from its operations in comparison to its capital expenditure and debt servicing requirements. Then, the related parties are providing the cash received from the company, back to the company in the form of interest-bearing loans to bridge the same cash shortfall. Loan outstanding at the start of FY2017/at the end of FY2016 = ₹18.5 cr. Loan outstanding at the end of FY2017 = ₹19.7 cr. Interest paid by the company on loans from related parties in FY2017 = ₹2.3 cr. An investor may interpret that contribution in the cash shortfall by high promoter remuneration and then bridging the shortfall by giving back the money by related parties as a loan to the company is a vicious cycle, which might have an effect of taking the economic benefit away from the non-promoter/public shareholders. Therefore, we suggest that an investor should do her own in-depth due diligence before she makes any opinion about the managerial remuneration or the loans from related parties. An investor would notice that the shareholding of the promoters has witnessed an increase by about 9% from 51.90% in March 2012 to 60.96% in December 2017. On the face of it, the decision of promoters to increase their stake in the company looks like a very positive development and shows the confidence that the promoters have in the future of the company. C) An important aspect to note here is that even though the promoters received 28,00,000 additional shares at ₹30 from the company by conversion of warrants during last three financial years (FY2009-11), however, they did not retain all of these shares with them. In fact, the promoters kept on selling part of these shares along the way. 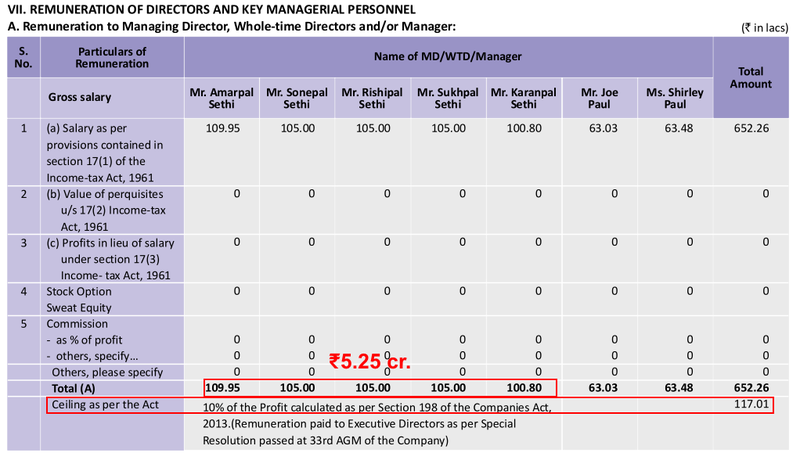 In FY2010, as per the table above the promoters received 14,50,000 additional shares from the company, however, during the year, their shareholding increased by only 6,25,839 shares indicating that the promoters sold 5,19,161 shares during the year out the new shares received by them from the conversion of the warrants. During June 2011 quarter, promoters sold additional 3,99,474 shares indicating that during FY2010, FY2011 and Q1-FY2012, the promoters sold about 14,73,396 shares out of the total 28,00,000 shares received by them from the conversion of warrants. Promoters had received these shares at ₹30 from the company. A look at the share price movement of the company over last 10 years shows that during FY2010 and FY2011, the share price of the company was consistently above ₹75 for the most period and has crossed ₹100 at times. It seems that the promoters used the opportunity of the share price recovery post 2008 global slowdown to realize the gains, which had accrued to them because of allotment of shares at a price, which was at a discount to the market price. Therefore, some investors may believe that the decision of promoters to subscribe the warrants is an act of helping the company by putting in their equity in the company. 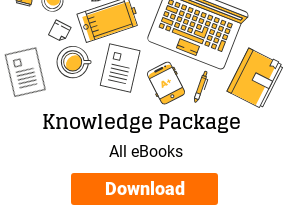 However, we believe that such deals where promoters enter into conditions of infusing part of the money upfront (10% in this case) and hold back remaining (90%) of the money to be infused at a later stage, are most of the times favouring the promoters/warrant subscribers. As witnessed in this case, the promoters agreed to infuse a total amount of ₹8.4 cr. 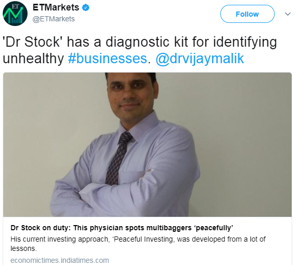 (28,00,000 * ₹30) in the company as equity. However, they infused only 10% of it (₹0.84 cr.) upfront at the time of allotment of warrants. They paid the remaining amount later when the market price of the shares was higher than the warrant allotment price (₹30). The promoters benefited by selling part of these additional shares received by them by directly selling these shares in the market at a higher price shortly after allotment. D) In FY2013, promoters increased their stake from 51.90% to 54.43% by increasing the number of shares held by them by 7,07,350. However, while reading the FY2013 annual report, the investor would note that out of these shares 7,00,000 shares were received by the promoters by conversion of convertible preferred shares (CPS) at par i.e. at ₹10 per share. A look at the share price history of the company would indicate that in the FY2013, the price of the company’s shares hovered above ₹30 whereas the promoters received the shares at ₹10 to increase their stake in the company. Investors may believe that the decision of promoters to infuse money in the company by way of preference shares reflects the helping hand by them to the company in times of liquidity stress. However, we believe that such arrangements where promoters/other parties get shares at par (₹10 in this case) irrespective of the level of the market price, has the potential of promoters/such parties benefiting at the cost of public/minority shareholders. E) The company has not issued any new share post FY2013. 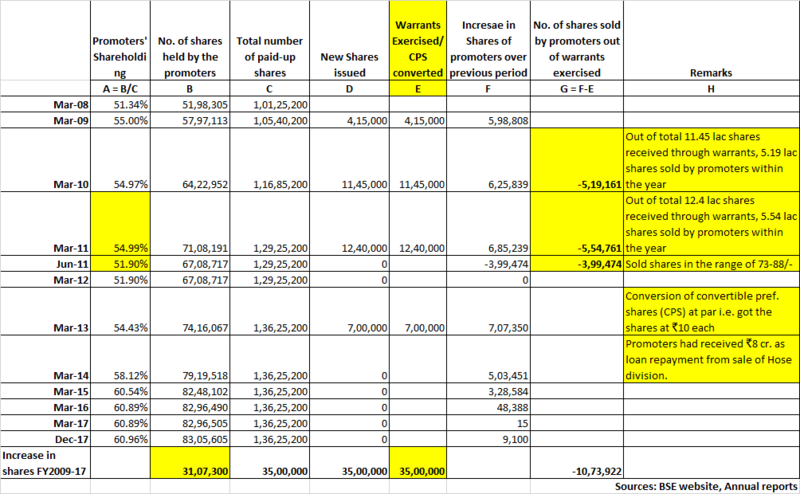 Therefore, all the additional shares acquired by the promoters post FY2013 indicate purchases from the market. An investor would note that most of the shares purchased by promoters post FY2013 coincide with when the promoters received funds from the company post the sale of hose division by the way of repayment of the loans from related parties. The loan outstanding from related parties declined from ₹17 cr. in FY2012 to ₹9 cr. in FY2013. From the above elaborations, an investor would note that the promoters are increasing their stake in the company from market purchases. However, in the past, the promoters have used the channels like warrants, convertible preferred shares etc. to get shares at a discount to the market price. Promoters have benefited themselves by selling such shares in the market at a higher price shortly after allotment from the company. An investor would also notice that the company has accounted for a current tax of ₹37 cr., which is the tax on the gains from the sale of hose division. An investor would note that the amount spent by any company for creation of plant & machinery is considered capital investment and is considered as cash outflow under-investing section. Similarly, whenever, companies sell their divisions, assets, then the cash received by them is shown as cash inflow under-investing section. Even though the company has shown ₹37 cr. as tax in the P&L, it has not shown commensurate tax outflows in the cash flow statement. Moreover, in FY2013, the company has witnessed its deferred tax liabilities increase by only about ₹1.6 cr. Deferred tax liabilities have increased from ₹10.7 cr. in FY2012 to ₹12.3 cr. in FY2013. Therefore, in all probability, the company has paid out the tax of ₹37 cr. 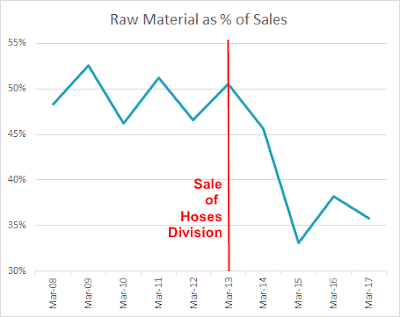 on the gains from the sale of hose division during the year itself. 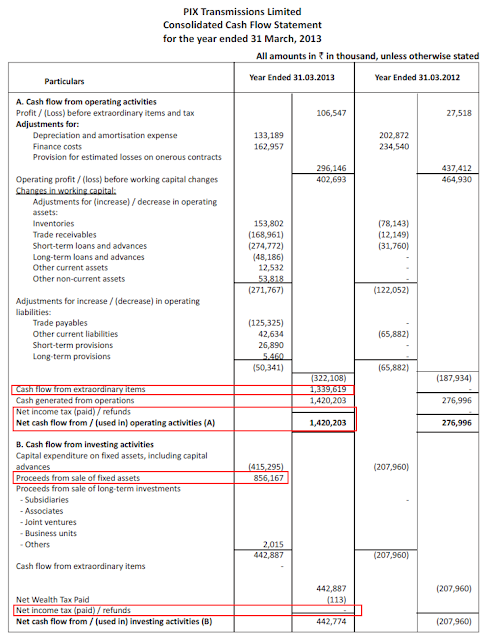 However, any mention of this cash outflow is missing in the cash flow statement. Considering this bifurcation, an investor would assume that the final sales proceeds received by the company from the sale of hose division would be ₹219.6 cr. (Gains before tax: ₹134 cr. + depreciated book value of ₹85.6 cr). However, when an investor analyses the credit rating report of the company prepared by CARE Ltd in 2014, then she notices that the total sales proceeds received by the company are ₹241.85 cr. Therefore, the investor is not able to ascertain the accounting treatment of the balance ₹22 cr. (241.85-219.6) from the sales proceeds. We believe that an investor may seek clarification from the company about its treatment of taxes in the cash flow statement of FY2013 and the balance sales proceeds of ₹22 cr. The investor should also adjust the cash flow from operations for the gains on the sale of hose division while doing the analysis of cash flow statement. This is essential because a single large item of ₹134 cr. in the cash flow statement if assessed incorrectly would have the effect of influencing the entire analysis. The above observations by the auditor of the parent company raise a concern about the accuracy of the consolidated financials reported by the company. The consolidated financials contain unaudited financial results of the subsidiaries. In a scenario, where the auditors of the subsidiary companies do not agree with the financials prepared by the management for the subsidiary companies, then in such a case the entire consolidated financials included in the annual report of PIX Transmission Ltd would come under question. We believe that an investor may seek clarification from the company about this aspect of non-submission of audited financials of the subsidiaries to the auditor of the parent company. However, while analysing these details, an investor would notice that the company deposited more money in the demonetized specified bank notes (SBNs: ₹1,000 and ₹500 currency notes), in the bank account than what it had with itself. The company deposited ₹517,000 in the SBN in the bank account whereas it had only ₹507,000 in SBN with itself. An investor should note that as per the company it did not receive any SBN from anybody during the demonetization period as the “Add: Permitted Receipts” is nil. Regarding the payment of rent of ₹1.47 cr. 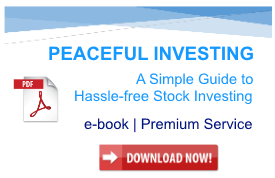 by the company to the related entity, we suggest that investors should directly take clarification from the company. Investors may seek details of the property taken on rent by the company in terms of the type of the property, its size, area, location etc. and in turn try to arrive at the possible market rent on their own from independent sources. Currently (January 28, 2018), PIX Transmission Ltd is available at a price to earnings (P/E) ratio of about 17 based on trailing 12 months standalone earnings, which does not offer any margin of safety in the purchase price as described by Benjamin Graham in his book The Intelligent Investor. Overall, PIX Transmission Ltd seems to be a company, which had been growing in a capital-intensive business at a moderate pace of 5-7% year on year. The company commenced on a major debt-funded capital expansion plan in FY2008-10. The company had to face the global slowdown. However, it did not roll back the capacity expansion plans and went ahead with the debt-funded capex. The company faced some liquidity stress in servicing the loans, as the CFO was not sufficient to meet the interest and repayment requirements, which might have been one of the reasons for the company to sell the hoses division despite having aggressive plans to make hoses as the predominant component of overall sales of the company. 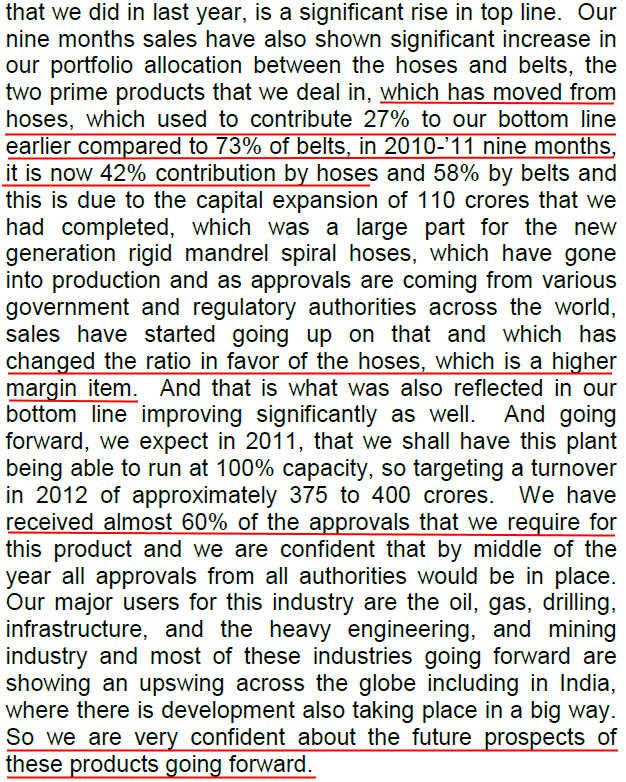 Since the sale of hoses division, the company has been again growing at a moderate pace of 5-7%. The asset heavy nature of the business operations and the low net profit margin indicates that the company’s inherent resources do not represent a self-sustainable growth. The SSGR of the company is negative. Therefore, it does not come as a surprise to investors that the company has again witnessed the debt rising up in recent years. The increase in cash balance since the sale of hoses division seems to be a result of incremental debt taken by the company. The promoters have made use of warrants and convertible preferred shares in the past to get shares from the company at a significant discount to the market price. The promoters have also benefited by selling part of these shares in the market at a higher price shortly after allotment. In the recent years, promoters are increasing their stake in the company by purchasing shares from the market. The promoters have been receiving a remuneration from the company, which is multiple times higher than the overall ceiling stipulated by the Companies Act 2013. The higher remuneration of the promoters is one of the factors contributing the cash flow shortfall faced by the company in meeting its capex and debt servicing requirements. The promoters/related parties have infused money into the company in the form of interest-bearing loans to bridge the cash flow shortfall and are earning interest income of about 12% from the company. The management has not been providing the audited financials of the subsidiary companies to the auditor for assessment of the consolidated financials of the company. The auditor of the company has to work with the management certified financials of the subsidiaries and therefore, the auditor has highlighted this aspect and his/her limitations in the audit report. Some of the aspects of the treatment of the cash inflow from the sale of hoses division need further assessment by the investors and may require the investor to seek clarifications from the company for better understanding. Investors may also take clarification from the company on the issue of not providing audited financials of subsidiaries to the auditor. An investor may also ask from the company whether there has been any instance where the auditors of subsidiaries have not agreed with the management prepared accounts. The company is able to improve its working capital position in the recent years, which has led to the improvement in the credit rating of the company. However, we believe that going ahead investors should keep a close watch on the inventory, receivables levels, debt position and changes in the promoters’ shareholding of the company. These are our views about PIX Transmission Ltd. 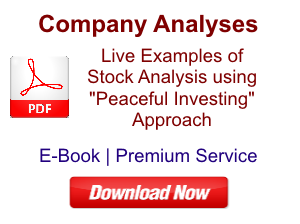 However, investors should do their own analysis before taking any investment related decision about the company.